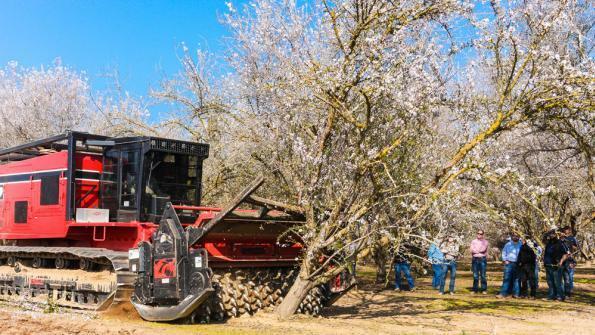 The use of the IronWolf 700B to clear orchards has the potential to completely change the environmental impact of California’s almond growing industry for the better. Equipped with the versatility and power that IronWolf industrial-grade machines are known for, the 700B is a purpose built crawler that was designed to serve a range of heavy duty functions within the agricultural, forestry, and construction and development industries. The 700B has become the master crawler for everything from concrete recycling and site excavation to flawless orchard clearing and tree mulching. What sets the 700B apart is that it is even more productive than previous versions. It operates with both Slasher and Crusher attachments, providing growers with that extra boost of efficiency that they need to make the switch to the more environmentally-friendly – and cost-friendly – process of grinding whole trees and reincorporating the valuable organic matter into the soil. It can move quickly, devouring large, older almond trees with a ‘one pass up, one pass back’ movement. This machine was designed to handle any challenge, and is proving to be an ideal solution for California’s almond farmers. Almond growers are constantly seeking that perfect balance in order to get the most out of their orchards and to sustain their businesses. Almond trees have to be spaced appropriately to ensure healthy growth. This means that older, unproductive trees regularly need to be cleared away to make room for new trees to be planted. In times of drought, some farmers make the decision to also clear trees before they pass their prime in order to save their resources for the most robust trees and most promising yields. In the past, to manage their orchards, almond growers were utilizing the very cumbersome and inefficient practice of pushing out older trees and then grinding the fallen trunks and branches into wood chips. The chips would then be transported and sold to be burned as biofuel energy in power plants. This process was robbing the orchards of valuable carbon and nutrients. It is also associated with serious problems with the health of the orchards including poor soil health and stunted growth. Another issue is with the burning itself; the San Joaquin Valley Unified Air Pollution Control District sets a limit on how much agricultural waste can be burned in order to protect the environment. By the second year of switching to the grind and recycle orchard clearing process, the grind plots were found to have “significantly more calcium, manganese, iron, magnesium, boron, nitrate, copper, electrical conductivity, organic matter, total carbon, and organic carbon.” Yields increased and the rise in the number of nematodes, which feed on bacterium and fungi, offer greater protection against disease. The powerful, consistent grinding and recycling process of the 700B has the capability to not only do the job, but to have the added benefit of nourishing the soil while also offsetting carbon emissions through sequestration. In a nutshell, the IronWolf is making the California almond orchards stronger, more efficient, and more sustainable than they’ve ever been before.